Oil States Oil Saver Rubbers are designed to provide a seal on the wire line while retrieving the swab string from the tubing or casing of a well. This sealing action contains the well pressure inside the tubing string. The rubbers also provide a wiping action of the wire line, which ensures a cleaner and safer job site. 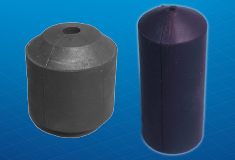 Oil States manufactures replacement rubbers for Guiberson, Regal/Bell, Bowen and Petrodyne oil-saver units.